Though it seems hard to believe, Earth’s gravitational pull is not the same everywhere you go. And as these gorgeously detailed maps now show, these variances are much greater than we thought. Top image: The low gravity atop Mount Everest (credit: GGMplus/Curtin University). Gravity varies on our planet owing to a number of factors. It's not perfectly spherical or uniformly dense. What’s more, gravity is weaker at the equator because of the outward centrifugal force produced by the Earth's rotation relative to the polar latitudes. And the higher you go, the further you are from the Earth’s center. 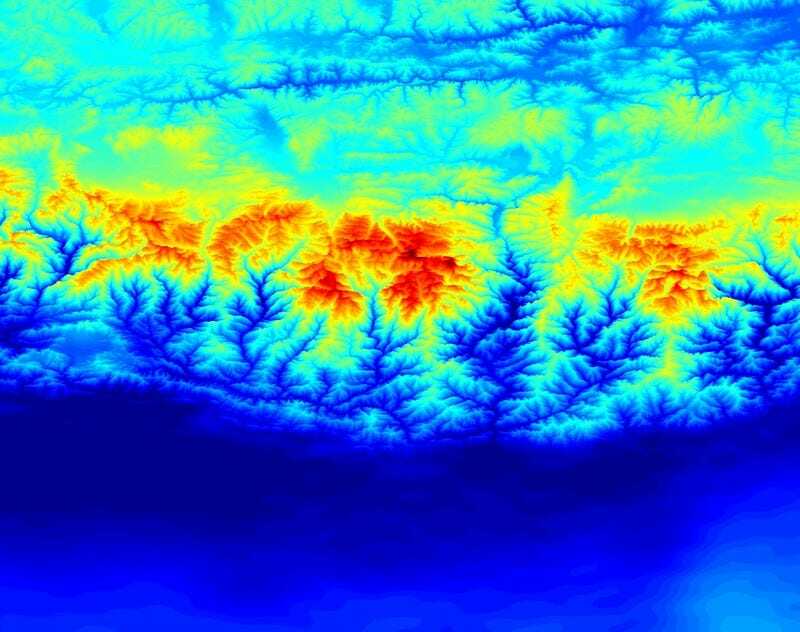 Now, in an effort to visualize these discrepancies, Christian Hirt and colleagues from Curtin University in Perth, Western Australia, have devised a mapping system they call Global Gravity Model plus (GGMplus). It provides maps and data of Earth’s gravity at an astounding resolution of 200 meters for all land and near coastal areas of our planet between +-60o latitude (which covers about 80% of the Earth’s land masses). The unprecedented ultra-high resolution maps were constructed using data acquired by the GRACE and GOCE satellites. Supercomputers were used to crunch the numbers. In terms of the gravitational variations, they found that Mount Nevado Huascarán in Peru has the lowest gravitational acceleration at 9.7639 m/s2, while the surface of the Arctic Ocean has the highest gravitational acceleration at 9.8337 m/s2>. These differences mean that in the unlikely event that you found yourself falling from a height of 100 metres at each point, you would hit the surface in Peru about 16 milliseconds later than in the Arctic. You would also lose 1 per cent of your body weight in moving from the Arctic to the Peruvian mountaintop, although your mass would not change. Read the entire study at Geophysical Research Letters: “New ultra-high resolution picture of Earth's gravity field.” And there’s plenty of more info — and images — at Western Australian Centre for Geodesy. Relatedly, the same technique was used by the same researchers to discover 280 hidden craters on the Moon. All images: Curtin University in Perth/GGMplus.